Escape from life's pressures in this well maintained oceanfront house overlooking Penobscot Bay. 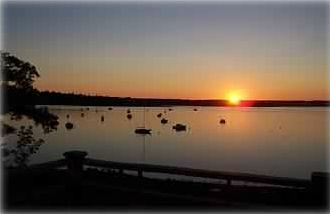 Located one mile from the center of town and a short drive to Camden and Bar Harbor. Home features large living room with propane fireplace, fully-equipped kitchen, sunny dining room, and master bedroom with a queen-size bed and full bath, all with water views. Second bedroom has queen-size bed. Third bedroom has 2 twin beds. Second full bath is shared. Enjoy your own private shoreline and view Searsport harbor from the large deck. Both the living room and kitchen open onto the large deck. Deck furniture is provided. Visit the Penobscot Marine Museum in Searsport and the many attractions within a short drive, or just spend peaceful hours lounging on the deck listening to the waves. Browse through the many antique shops in the area or golf at the lovely Searsport Pines 9 hole public golf course. Acadia National Park is a scenic 50 mile drive to the East. The area also offers spectacular fall foliage. Winters here are fun and beautiful as well. Enjoy the cozy atmosphere and warmth of our propane fireplace after a day of skiing, sliding, hiking or snowshoeing. Enjoy a working vacation. We have a wireless, high speed internet connection. We can create office space in a bedroom, in the sun room/dining room or you can work on the deck. 2Both bathrooms have a tub/shower combination. We have a 3 zone oil fired baseboard heat system. House is well insulated . Large parking area with plenty of room for a boat or camper. We have a couch, love seat, and 3 easy chairs. There is seating for 8 people but extra seating can be moved in. The table can be extended by leaves provided. We have booster seats that can be used as a highchair. (2) We have Direct TV. The deck is 30 by 10. We have an umbrella table and 4 chairs. We also have a lounge, chaise, and other chairs on the deck. DVD/CD player, Ping Pong Table in walk out basement, Wireless, High Speed Internet Connection, propane fireplace, Pets with Permission Property owner would like to contact all travelers personally before booking!